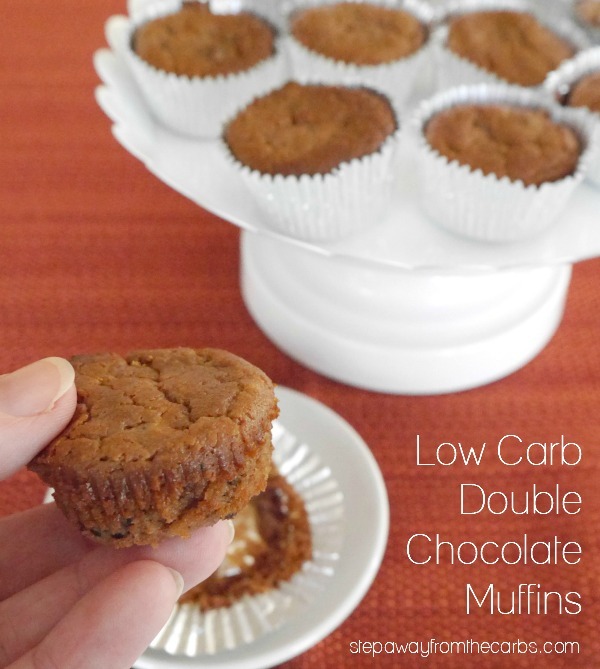 These low carb double chocolate muffins are fudgy, soft, and delicious! 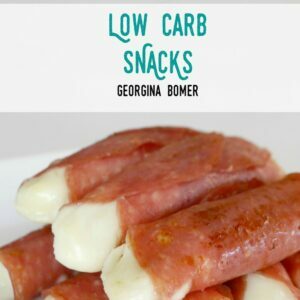 Gluten free, keto, and sugar free recipe. This originally started as a double chocolate cookie recipe. But I played around with the ingredients and quantities so much that I ended with something more like a batter than a dough, so I decided to make them into muffins instead. And I’m SO glad that I did! The cream cheese makes them soft and the double hit of chocolate is very welcome! On the day I made these my husband had a couple of buddies over, who were VERY happy to demolish these muffins. They clearly didn’t taste like “diet food”! My husband is very sensitive to the taste of sweetener, but he reported not a hint of artificial flavor in these treats! I’ll definitely be making them again – not least because there aren’t many left now! Place softened butter and cream cheese in a stand mixer bowl and beat until combined. Add xylitol and beat again (you can, of course, use whichever sweetener you prefer, but I really like xylitol for baking. Remember to amend the nutritional data if you switch sweeteners). Add an egg, unsweetened cocoa powder, baking powder and almond flour. Beat until smooth. Add in some low carb chocolate chips (I use Lily’s Sweets dark chocolate baking chips) and stir well. Divide the mixture between mini muffin cups that have been lined with mini muffin cases. The mixture should fill around 16 cases to about two-thirds full. Bake in a preheated oven for 15-18 minutes until firm on top. Leave for 5 minutes to cool before enjoying these chocolatey fudgy delights! Place the butter and cream cheese in a stand mixer bowl and beat until combined. Add xylitol and beat again. Add the egg, cocoa powder, baking powder and almond flour. Beat until smooth. Add in the chocolate chips and stir well. Bake for 15-18 minutes until firm on top. Leave for 5 minutes to cool. 2g net carbs per mini muffin, not including sugar alcohols. Are xylitol and erythritol the same thing? No, but they are both sugar alcohols. They have slightly different characteristics, so it is really personal preference which you use. These muffins sound like a great success. I think you can never use enough chocolate! Double sounds just about right to me. Is the xylitol a powder? 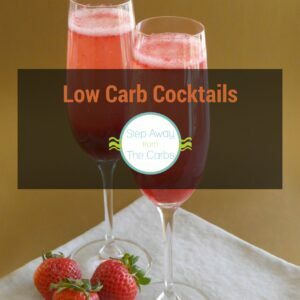 It is an alternative to sugar that is lower in carbs. It comes in granulated form like regular sugar. I’ve given a link in the post to a brand that I like on Amazon. I am in love with these healthy muffins! 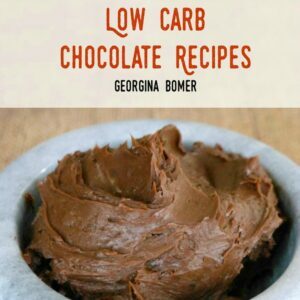 I would have never guessed that they are sugar-free, Georgina! You had me at double chocolate! I love to have muffins on hand for breakfasts! How much baking powder do you use? It only says “1/2 baking powder” is it teaspoon or tablespoon. Thanks. I’ll definitely be making this. 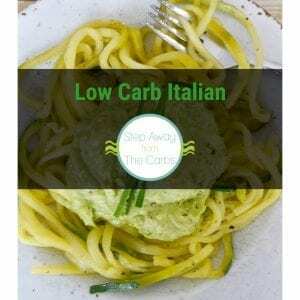 Recipe corrected Martina – sorry about that! It should be 1/2 teaspoon. Can this be made into a larger cake? How long do you suppose it would take in the oven. Thank you! I’ve never tried it! I guess cooking time would depend on how deep you made it and how the hot the oven is. If you try it, please let me know! I love adding cream cheese to muffin and cake recipes, the result is so moist and delicious. I am always glad for happy accidents and it looks like these muffins are perfect. They are! My son has already requested I make a second batch! These look like the perfect texture! I can see why they were gone so quickly! I’m not a fan of almond flour. Can I substitute for coconut flour? I haven’t tested the recipe with coconut and the flours are not interchangeable. If you try it, you’ll need to add at least another egg so the muffins aren’t too dry. Let me know how you get on! Wow, ok I just made these and they are SO good! I used sukrin (a type of erythritol) and added just a 1/2 tsp of caramel extract. Thanks for sharing the recipe! I love the idea of adding caramel extract. Yum! Can you tell me how accurate your carb counts are? I want to make these for a diabetic 3 year old child, so if these are “guestimates” I’d need to know that. Hi Doreen! I care very much about my carb counts so these are as accurate as I can make them. They are calculated via my recipe card, which pulls in data from the USDA database. If they don’t list an ingredient, I add it as a custom one. With recipes like these muffins, the only confusion comes when people use different sweeteners, and whether they count sugar alcohols. What sweetener do you use for the child?